Turn an underperforming website into a thriving online presence. We also show you how to properly build and optimize a new site. Search Engine Optimization (SEO) is a complex science, with a simple goal. Getting your website found. From the first audit to the last title tag, our experts continuously drive relevant traffic to your website. As an SEO company, it’s what we do best. Powered by Search uses a no-nonsense, data-driven approach to achieving success with search engine optimization. It all starts with an SEO audit — Imagine having a predictable roadmap to improving the health, content, and technical performance of your website in every way possible. Next, we dive into a rigorous competitive audit that unlocks the key to SEO success in your industry. Imagine reverse-engineering the exact formula your competitors are using to out-rank your brand, and then executing on compelling content that attracts your most profitable customers. Picture having a defensible advantage that leaves your competition in the dust. With our holistic SEO solutions, we'll help your brand achieve the organic search performance you deserve. Since implementing their recommendations into our new website, we’ve seen a significant increase in Garage Door related traffic from search engines, in under 6 weeks. A must-read guide to Enterprise SEO. Last Update December 12, 2016. Do you work with a large or complex website or need to polish up on your Enterprise SEO knowledge? You’re in the right place, because this comprehensive playbook offers everything you need to know about learning, performing, and winning in an enterprise environment. We’ve been experts at Enterprise SEO for over a decade, and in that time we found that most other experts have a very fragmented view of the enterprise search landscape. This playbook is for you if you want to find the right SEO platform, know the KPIs, and understand the Enterprise SEO ecosystem. What is the state of the Enterprise SEO industry? How do I determine my Enterprise SEO budget? Who are the leading players in the Enterprise SEO platform space? How do I choose an Enterprise SEO agency? What skills should an in-house Enterprise SEO Strategist have? Which CMS is best suited for Enterprise SEO? Gain organizational buy-in and alignment to support your initiatives. Secure enough budget for your Enterprise SEO initiatives. Identify the right technologies and platforms to increase your effectiveness. Manage your Enterprise CMS and identify your options to make it SEO friendly. This playbook was created for those with an intermediate to advanced level of SEO knowledge. If you are a beginner at SEO, we recommend you go through our 9 SEO Myths You Must Stop Believing In, and our SEO Cheat Sheet. Search Engine Optimization (SEO) is a marketing discipline that focuses on increasing visibility and traffic from organic (non-paid) search results, arriving from popular search engines like Google, Bing, and YouTube. A complex and hierarchical organizational structure with many silos. An organizational structure in which every new content asset for your website has to be approved by brand and legal teams. A large website that may have 10,000 – 100M+ pages. A complex website architecture or infrastructure. Enterprise SEO involves finding a way to implement fundamental SEO best practices on each and every page of your website (which may number in the thousands). Doing so is no easy feat, because you’ll need to work with multiple internal and external stakeholders within the constraints of time, budget, technological impediments, and organizational buy-in. Note: If you don’t have the time to go through this 41 page playbook right now, you can download it for later reading. Enterprise SEO best practices come in many unique flavors, depending on the size and scope of your business. You’re an Enterprise eCommerce business if you you carry many thousands of SKUs on your website. Make sure every one of your SKUs are crawled, indexed, and show up in search results on your domain name. To verify this anecdotally, try typing site:yourdomain.com “sku name” into Google. It’s likely that you obtain product information through a data feed from a merchant. Duplicate content and lack of unique content on your product pages is a big issue, because there isn’t much difference between your website’s content a competitor that carries the same SKUs. Your brand has a large number (100-5000+) of brick and mortar locations regionally, nationally, or globally. Your customers search for store information, hours of operation, and directions using search engines and mobile apps. Make sure every one of your stores have an independent store page which is crawled, indexed, and show up in search results on your domain name. To verify this anecdotally, try typing site:yourdomain.com “store name/store address” into Google.. If you have a franchise based organization, many of your stores will have similar products and services, with little differentiating information other than Name, Address, and Phone Number. This creates duplicate or similar content issues. “Near me” searches have increased 86% in 2015. If you build a custom store locator on top of a bloated enterprise CMS, you may suffer from slow page load speeds. Page speed is a core ranking factor in mobile SEO, so it’s crucial to load your store information as quickly as possible on a mobile device. Real Estate Portals using IDX or Broker Property Data (eg: Remax.ca). Stock Websites using index information from NYSE, DOW Jones, TSX, etc (eg: Yahoo Finance). Sports websites that use structured data to create content around player and game scores and performance (ESPN.com). Ensure that your newest content is indexed as fast as possible. Google tends to display ‘fresh’ information at the top of it’s search results. This is powered by an algorithm called Quality Deserves Freshness (QDF). Duplicate Content: Because your website uses the same data feeds as other competitors in your industry, Google sees a large percentage of duplicate content. Site Architecture: Your site architecture must allow new content to get discovered easily. Archaic CMS configurations can be challenging to navigate. 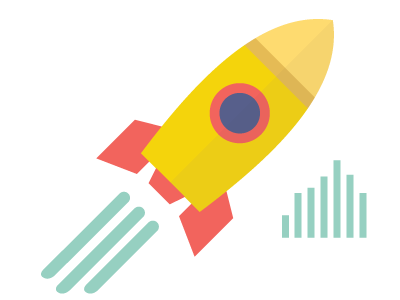 Speed to Market: In the race to the top, how fast you can get your content crawled, indexed, and ranked is of utmost importance. Domain Authority: If you cannot win at speed to market, you will need to increase the authority of your domain so that Google and other search engines favor your results over your competitors’. Building domain authority is a slow and arduous process, but the benefits are worth it. Your brand has a presence in two or more countries, and may have multi-regional, multilingual support. This increases the complexity of SEO since you website needs to serve a diverse audience. Employ a unified and holistic strategy to help Google and other search engines understand the relationship between your brand’s different domains, subdomains, or internationalized subdirectories. Mitigate duplicate content risks by assisting Google in understanding the same content that is translated into multiple languages. Assist Google in serving localized content above the parent brand’s content (eg: asus.ca vs asus.com) even if the regional domain has lower domain authority. Due to having multiple stakeholders in every region, you’ll need to improve alignment to make global SEO decisions. You may have to deal with interesting exclusions and legal policies in which certain content works in a particular country but doesn’t in another. You may have to deal with content that exists in one or more languages but does not exist in all languages. You work at a news portal or publisher where you have a mix of original content and content sourced from data feed services such as Reuters and the Associated Press. Increase visibility in vertical news search engines such as Google News. Increase universal search visibility in Google and other search engines. Increase speed to market to become the first to break a news story. This has ripple effects on social media when readers share your story, ultimately strengthening your SEO. Duplicate content continues to be a challenge that plagues news publishers who re-publish content from sources such as Reuters and the Associated Press. Domain Authority is a major factor in surfacing news content from authoritative publishers like the New York Times. Your company runs a UGC (User Generated Content) portal where users are creating hundreds of thousands of content pieces daily. (eg: Quora, YouTube, Tumblr). Make sure Google discovers every new content update as fast as possible. Interlink related content together to increase discoverability. Use elements of the user generated content to dynamically perform On Page SEO. Because your users are creating publicly indexable content at a rapid pace, it’s difficult to keep up with the SEO health of your website. You will need a rigorous system of SEO health monitoring. You’ll need to invest in business logic to identify topic and thematic relationships between similar or related pieces of UGC. Interlinking between these on your site will help more content get discovered by Google. According to Jupiter Research, a Forrester Research company, 81% of users find their desired destination through a search engine. Despite investment in SEO expecting to reach $80 billion dollars in 2020 (Borrell & Associates), Enterprise SEO budgets are still only a fraction of Paid Search budgets. The long term benefits of SEO are undeniable. Organic Search results get clicked 8.5 times more often than Paid Search results. Regardless, SEMPO, the Search Engine Marketing Professionals Organization, estimates that 87% of search engine dollars are spent on PPC vs. 11% on SEO efforts. It takes longer to see sustainable results. It requires more effort than Paid Search in terms of organizational alignment, support, 3rd party agency support, platforms, and technology flexibility. It lacks inherent platform support from the search engines you are optimizing for, in the sense that Google and Bing won’t provide the same level of advisory or support as they do for their Paid Search platforms. For every $1 invested in Paid Search, SEO generates $5.66 in revenue opportunity. At over 500% ROI vs PPC, marketers who double down in their SEO budgets have a high-leverage opportunity to seize the day. Demand for SEO is growing at a healthy 5% – 8% per year. In 2016, SEO spending in the United States is at $65.26 Billion, and it’s projected to grow to $80 Billion in 2020 as aforementioned. 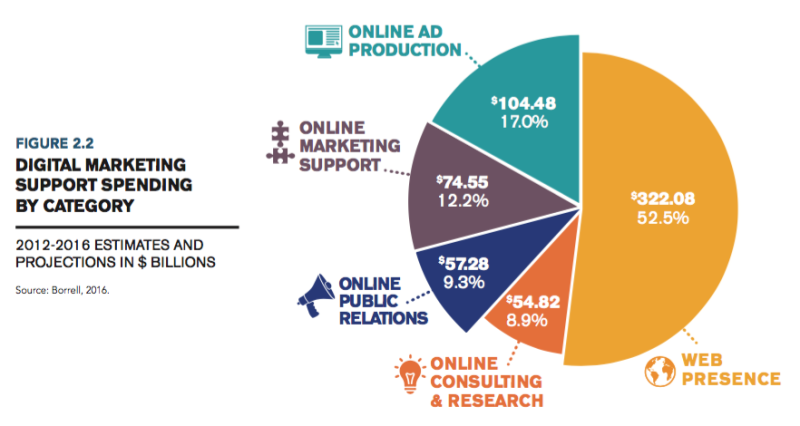 SEO accounts for 12.2% of all Digital Marketing Services budgets. Single-use and all-in-one platforms continue to grow, with most tools and platforms offering more mature solutions. The space continues to see a lot of fragmentation, with very few real leaders in the platforms category. All-in-one platforms are expanding capabilities to match those of single use apps. All-in-one platforms are maturing their recommendations and business case building capabilities. Agencies, frustrated with a lack of mature solutions in the market are continuing to build out single-point solutions for reporting, link analysis, penalty recovery, and other specific use cases. For a large organization, Enterprise SEO requires a team comprised of several roles in order to operate effectively. Due to the complexity and scale of large websites, it will require a team to meet your SEO goals with varying degrees of expertise and responsibilities. These are SEO foot-soldiers. They are responsible for directly performing tasks such as keyword research, on-page optimization, or building links. Large enterprises will likely not employ Specialists directly, instead choosing to partner with an agency that fulfills this role. Common Job Titles: SEO Specialist, Digital Marketing Specialist. An SEO or digital marketing strategist role is the most skilled and experienced individual contributor on the team. They can occasionally perform the same tasks as Specialists, but are more often required to use their mastery of SEO skills to provide solutions to complex problems, lead enterprise-scale audits, and define SEO strategy from a technical point of view. An enterprise team may have Strategist(s) in-house or through an agency. Common Job Titles: SEO Strategist, SEO Analyst, Digital Strategist. In-house, the manager is responsible for leading the team of Specialists and Strategists to accomplish the department's goals. They also often serve as the main driver and point of contact with agency partners. An effective manager will possess well-rounded digital marketing skills, and likely past SEO experience. Common Job Titles: SEO Manager, Marketing Manager, Digital Marketing Manager, SEO Team Lead. This role is responsible for meeting the organization's key business objectives set by the Executive team and ensuring that the marketing department is returning positive ROI. A director will lead and oversee the department's management team. In other management structures, they may directly lead Strategists and Specialists. Common Job Titles: Director of Marketing, SEO Director. This role sets the direction and strategy for the entire marketing department to drive the entire organization's goals. While this role can be far removed from day-to-day SEO efforts, they are still deeply invested in the overall performance of the team. They are ultimately be responsible for budgeting decisions and organizational buy-in for SEO initiatives. Common Job Titles: VP of Marketing, CMO. The definition of what an SEO does has rapidly grown over the years, and as such many people who used to identify them with ‘SEO’ in their job title have transitioned to other titles.According to the 2016 Inbound Marketing Jobs Salary Guide from Conductor, for the first time in years, the SEO job market declined 6% in roles and about 7% in average pay. The strongest decline was in SEO Coordinator roles (19%). However, rather than this signifying a decline in SEO, this is regarded as a positive sign that SEO is becoming more of an essential skill rather than a dedicated role in itself. It means that marketers of any title should possess some SEO skills in order to effectively perform their role and is further evidence that every organization must possess a strong foundation in SEO. Note: You’ve made it halfway through our playbook, congrats. If you need to take a break, download this guide so you can keep going later. The KPIs used by Enterprises differ significantly from those used by SMBs. While a small and medium business may be able to get away with only tracking overall revenue, an enterprise needs to take into account a large number of additional, intermediate factors. Every business, no matter the size or industry, needs to consider these KPIs when examining their SEO performance. Each KPI can be associated to the Organic channel—visitors from non-paid search results—which is a segment within any analytics tool. Search Traffic. How many visitors come to your website from organic searches? How does this compare to our marketing objectives? What should our marketing objectives be given particular market placement and business factors? Conversion Rate. SEO impacts the conversion rate of a website by both funnelling traffic to preferred landing pages as well as identifying opportunities for improvement. Leads or Sales. How many leads or sales are attributable to the organic search channel? The challenge for enterprises is in accurately determining these numbers where they’re not always straightforward. How does one track a user who found the website and then went to a retail location? Average Order Value (for eCommerce). The average order value (AOV) of an eCommerce website relates to our success in upselling an engaged user. While many businesses have tiered products or upsell through their sales team, eCommerce businesses can achieve a higher conversion value by influencing the number and value of products in a sale. These metrics are crucial for determining the success of an Enterprise’s SEO investment as well as informing future actions. Overcoming Enterprise SEO challenges is rewarding and will positively impact an enterprise’s bottom line. Of course, choosing to not address them is ruinous. These are the SEO challenges that enterprises must face head on. SEO tactics will vary depending on on who owns them in an enterprise organizational structure. IT – SEO will likely be highly skewed towards Technical SEO ‘projects’. Getting them implemented however will be a bigger challenges, with most SEO development related tasks put on the back-burner of development sprints. Marketing – SEO will likely be skewed towards content strategy and content marketing. The trouble here is that Technical SEO is typically under-appreciated. When it is appreciated through continuous education, expect to make business cases to vie for development time and IT resources. Increasing Indexation Ratio – How many of the many hundreds of thousands and perhaps millions of pages on the company’s domain and subdomains are recognized by Google? If there’s anything less than 80%, there’s room for optimization. Changing pages from invisible to visible in Google means that they can now rank for long tail search terms. Optimizing Thin Pages – Generally speaking, you’ll find too many pages with too little content, or pages that are blindly addressing every topic under the sun (usually with very poor keyword targeting). The solution here is to start enriching thin pages with content mapped to keyword intent, while breaking apart the “frankenpages” into thematic silos. Improving Internal Linking – Generally speaking, links are pointed towards the home page or the 1st tier directory structure of most large websites. Great content tends to be buried within many levels of the enterprise site’s directory structure. Improving internal linking is a low-effort, high impact way of funnelling link juice from top level pages to content that deserves to rank in search results. Publishers fight for quality content creators and work towards generating traffic for both their primary portal and their downstream aggregators. Massive media organizations have their content re-published across their portfolio of distributors, leading to duplicate content across multiple domains. eCommerce websites struggle to have relevant, persuasive and actionable content for each SKU. For small and medium sized eCommerce businesses, this is less of a challenge. In the enterprise space with potentially millions of SKUs, the cost of creating content is enormous. Multi-Location Real Estate and Automotive websites look to provide accurate and valuable data across smaller regions. They tend to overspend on content. SaaS and Service providers strive to balance content between quality and quantity of content. Businesses in the Financial Institutions, Legal, and Insurance & Health industries need to follow strict legal requirements around claims, guarantees, testimonials and superlatives in content. Laws vary across regions. SEO is influenced by an enterprise’s agility, or lack thereof. With competing objectives, role changes, and significant hierarchical boundaries, there are many elements that slow the entire process down. Enterprise SEO plans should always have multiple variants, each with its own legitimate business case. Priority will ultimately impact execution speed. Being effective at Enterprise SEO requires a comprehensive skillset across many disciplines. Expertise in all areas of SEO is a must, but strong business skills and a balanced understanding of your organization’s digital marketing capabilities are often more valuable in order to thrive. An individual or team with exceptional technical SEO skills that operates in a silo only has a small chance of leading a large organization to success. Alternatively, a marketing team that excels at working with all stakeholders but has few SEO capabilities will also lead to limited results. Maintaining how search engines discover your website. Targeting the most impactful terms that lead to positive ROI with keyword research. Optimizing website content for keyword relevance, quality, and audience engagement. Understanding how other websites link to you as a result of digital marketing campaigns. Interpreting analytics data to make decisions on implementing SEO campaigns. Influencing how search engines explore your website on a massive scale. Search engines have what is called a ‘crawl budget’ and will not visit every page of a large website on a regular basis. An Enterprise SEO Strategist must be able to manage the website’s indexation ratio to ensure that the majority of valuable content appears in search results. Targeting multilingual content to searchers in international locations. A large website that serves a global audience will likely have content that serves various countries and languages. A non-optimized website risks users discovering content in search results that does not match their region. An Enterprise SEO Strategist must be able to prevent that to support global engagement and success. Optimizing the on-page factors of thousands of web pages at-scale. Making manual updates to thousands of individual pages is unfeasibly time consuming. As a result, an Enterprise SEO Strategist must be able to scale their core on-page SEO skills to deliver recommendations on a template-level. This requires resourcefulness and a strong understanding of the technical capabilities and dynamic nature of your website. Managing the health and growth of a large link profile. A large website with a strong brand and history of digital marketing campaigns will likely have thousands-to-millions of backlinks originating from across the web. An Enterprise SEO Strategist must be able to monitor and understand how to keep such large link profiles healthy. They must also possess the skills and experience to craft link and PR campaigns to earn the highest quality links to increase authority. Drawing meaningful insights from large volumes of data. Enterprise websites with effective analytics solutions such as Google Analytics or Adobe Analytics will generate massive amounts of performance data. For an Enterprise SEO Strategist this can be an invaluable source for SEO learnings, but it requires adept analytics skills including custom reporting and mastery of Microsoft Excel. Furthermore, they must be able to translate their findings into meaningful information for marketing and executive teams. Aside from pure SEO competencies, an effective Enterprise SEO Strategist must be able to break down silos across the entire organization. With a large number of stakeholders across multiple departments, implementing SEO campaigns cannot be performed in a vacuum. This starts within the marketing department, and they must be able to collaborate and unify efforts across other marketing channels such as content, PR, PPC, or social media to have the most impact. However, SEO efforts also require buy-in from other departments such as IT, Finance, and C-Level Executives. Here, an Enterprise SEO Strategist must be able to communicate effectively and strategically across each department with the organization’s overall success in mind. Enabling each stakeholder to fully understand the big picture and ROI of SEO is one of the most critical attributes to have. Enterprise SEO requires expertise with a myriad of industry tools in order to fully research, audit, and monitor large websites for organic search performance. In general, enterprise SEO tools must have the power and flexibility to potentially analyze millions of keywords, web pages, content, and links in order to be valuable for making key decisions. The monthly costs of these tools can quickly add significant expenses to your SEO budget. If used effectively, these tools can also prove to be powerful assets for improving your long term SEO success and ROI. Enterprise SEO platforms are a suite of tools that provide extensive data and insights for multiple SEO considerations such as keywords, content, on-page, links, and competitor efforts. They also provide features and functionality to suit the needs of multiple stakeholders across marketing and executive teams with custom reporting, ROI forecasting, and predictive analysis capabilities. These platforms reduce the need to invest in several individual tools with similar functionality and have the benefit of consolidating data within a single environment for a comprehensive set of data and intelligence. Analytics SEO – International SEO insights and keyword tracking. – (not provided) keyword insights. BrightEdge – Content-centric analysis and optimization. – Backlink tracking, insights, and recommendations. Conductor – Keyword, Content, and Competitor tracking. – Customized reporting dashboards for stakeholders. gShift – Keyword, content, and competitive insights. – Internal and external content URL tracking. Linkdex – Multi-scenario SEO forecasting. – Keyword research, insights, and domain comparison. RankAbove – Global keyword rank tracking and competitor comparison. – Content insights based on trending topics. Rio SEO – Local listings management for multiple locations. – Local SEO reporting dashboard for citations & reviews. Searchmetrics – Analysis & forecasting for SEO, content, and social media. – Mobile SEO keyword, content, and trend analysis. seoClarity – Automated site crawls for million-page websites. – Google Webmaster Tools & AdWords integration to reduce (not provided) keyword gaps. Enterprise SEO Strategies are hugely dependent on industry, budget, current market placement, agility, aggressiveness or risk tolerance, existing infrastructure and multi-team stakeholder buy-in. With that having been said, these are the top 5 Enterprise SEO strategies that apply to a good proportion of enterprise-class websites. When working with millions of pages, it’s important to leverage dynamic content. Consider Insurance. Home and Auto insurance companies, for the most part, understand that they need to have and maintain content that describes their services. This is a small amount of content that should be easy to both create and maintain. However, this industry also has a huge amount of region-specific searches. For example, “Condo Insurance in New York” or “Car Insurance in Fort Lauderdale.” How does one create powerful, persuasive and useful pieces of content that will pull in that aspect of the Insurance market? For each of our service and location pages, such as “Condo Insurance in New York,” we need to have unique content that answers the need of the searcher. In this example, having access to data sources is key. How much have condo or homeowners in New York paid in damages in the past ten years? How many natural disasters have occurred? Has the cost of condos and condo maintenance been rising? Is that cost high comparable to other cities within the state? How common is theft in New York? Is incidence of theft rising? Is the city more at risk than other cities within the state? What kinds of cost savings can a New Yorker get through government programs? Have local users left positive reviews for us? Each of these data points can be put into dynamic content and used to tell a persuasive story. They’re available through various APIs, and allow the creation of these pages dynamically on a massive scale. Implementation can change dramatically between industries, what we’ve listed here is a general strategy. From an SEO expert’s perspective, a website is a series of pages that are each targeted at a specific idea. The act of doing the research around which ideas are most valuable and represent a market the best is called “Keyword Research.” It defines the foundation of any website. Enterprise websites have massive foundations. While the scope is somewhat intimidating, it’s even more frightening that the foundation may have had little to no thought behind them, or that it’s old and falling apart. In many cases, we find that the best strategy for both short and long term results is to refine this foundation, retargeting and expanding the keyword and content map to dominate the market. A site’s “structure” is like a web where each node is a page and each page is connected to other pages by links. Links from our website are called internal links, and links from other websites are external links. Internal links connect the pages of a website together. This allows users and search engines to navigate through a site and discover content. These links may be website navigation, in-content links, breadcrumb links, footer links, or even pagination links. Every link on a site, whether humanly visible or not, matters for Enterprise SEO. A good rule of thumb is that your most valuable pages, which are referred to as Preferred Landing Pages (or PLPs), should have the highest number of internal links. Consider your site navigation. Since that navigation is available on every page of your site, it means that every link in your navigation is on every page of your site. These must be extremely important pages. If they’re not that important, they’re stealing ranking and traffic power from other pages. Using this thought process, we organize enterprise sites so that the most valuable pages get the most activity. Two types of structures are shown below. Enterprise websites have complex structures, and within these structures it’s important to ensure that the most valuable pages get the appropriate amount of internal links. An extremely effective strategy for enterprises is to establish the priority of each page across millions of pages, and create an implementation plan that results in each page being internally linked to according to its search potential and ability to achieve business objectives. Historically, it has been popular to split enterprise websites up into subdomains or completely separate domains to service different LoBs. This is popular with Financial Institutions (FIs), where you might see a domain for investing, loans, (ultra) high net worth, and personal banking. In a report that Powered by Search put together in 2013, we found that by far the most successful parent companies in the FI space, in both the US and Canada, fit under a single domain. Even if the distribution of content sits mostly under a single domain and subdomain, we frequently find that the distribution of content doesn’t achieve business goals. For enterprises looking to aggressively improve their market position, content consolidation is an excellent strategy. Domains and pages that may be competing with each other can be used to support each other, and a more consolidated view of the web presence of an organization presents an easier way to see gaps and opportunities moving forward. It is possible to make a very small change to your website which causes catastrophic drops in traffic, leads, and revenue. In fact, we’ve seen this happen on several occasions with enterprise-class websites in the Telecom, Real Estate and eCommerce spaces. Many decisions are made by developers, different LoBs, and third party vendors that are outside of a single enterprise’s control. The only way to ensure that issues are identified and addressed before there are significant repercussions is to constantly monitor the site’s health from an SEO perspective. SEO decisions within a large organization will no doubt involve multiple stakeholders and departments to collaborate and communicate. For Enterprise SEO to be effective, it’s an absolute must to break out of silos and ensure that there’s buy-in among the team since SEO activities and campaigns directly impact marketing performance. Each stakeholder will have different objectives, needs, and knowledge of SEO, so bringing everyone together can be a challenge. Below are the key stakeholders that will most often engage with Enterprise SEO initiatives and what to keep in mind when collaborating. An Enterprise SEO agency can be a force multiplier or a dedicated source of SEO expertise for your organization. If your marketing team already has SEO resources in-house, you’re already ahead of the curve. However, even with this team, you may find that the sheer size of an enterprise website can become unmanageable solely within the walls of your organization. In this case, an Enterprise SEO agency allows for high impact scaling of your SEO capabilities for relatively low cost. However, if there is no dedicated SEO resource in-house, an agency will serve as a trusted partner to support your organization’s efforts. This allows you to leverage Enterprise SEO experience, expertise, and resources to achieve success without the expenses of building out a new team. When working with Enterprise SEO agencies, it is critical to collaborate as partners. An agency should be seen as an extension of your organization’s marketing team. Successful Enterprise SEO efforts are a result of advocacy, buy-in, and support from the C-Level. As key decision makers, the C-Level must also be kept appraised of the true value of SEO efforts in order to secure the budget needed to execute campaigns. When communicating to the C-Level about Enterprise SEO, technical implications will likely not resonate as strongly as the impact SEO will have on the bottom line. Ensure that your reports and insights are high-level and directly tied to ROI and value. SEO is ultimately a marketing discipline, so there will be regular collaboration with other stakeholders in this department. Effective Enterprise SEO necessitates a close bond with these teams for mutual success. The strong brand awareness that typically accompanies an enterprise website can be highly beneficial for SEO efforts. This can lead to significant branded organic search traffic as well as naturally accumulating offsite authority and link opportunities. Stakeholders from the Brand Management and SEO teams should work closely together on brand awareness initiatives to increase the impact of directly benefiting both brand strength and organic search visibility. Search engines favour high quality and optimized content. As a result, organic search success requires content and SEO to be intrinsically linked. Content and SEO stakeholders must closely collaborate to ensure that all valuable pages on the website meet SEO requirements for on-page factors, depth, and quality. However, both stakeholders must also ensure that content is engaging and effectively targeting the right audience and not search engine bots alone. Content can be one of the strongest drivers of long-term SEO success and it should be a goal of each stakeholder to work closely together to develop campaigns that meet everyone’s objectives. While organic and paid performance are independent of each other, both stakeholders can support each other’s effectiveness and ROI with strong collaboration and information sharing. For PPC stakeholders, an optimized SEO presence can result in increased ROI and reduced cost on ad campaigns. Traffic with longer buying cycles or top and middle funnel intent can be targeted with focused organic search efforts. This allows for more budget to be strategically allocated to bottom-of-funnel keywords to attract traffic that is more likely to convert following an ad click. For SEO stakeholders, PPC performance and insights can be valuable when performing keyword research and on-page optimization. The large volumes of data available from paid search campaigns can directly support the SEO team with research and strategy. While SEO should ideally be within the Marketing department, an organization’s structure may place it as a function of IT. Nonetheless, close collaboration between SEO and IT stakeholders is required to ensure that recommendations and changes can be effectively implemented on the back-end of the website. When working with IT stakeholders, the SEO team must clearly communicate technical requirements with working knowledge of the technical language and capabilities of the website. A high degree of communication can reduce the chances of implementations being delayed in queue, and lead to more timely SEO impacts. Working effectively with business analyst stakeholders requires a strong data-driven mindset. For an Enterprise SEO, this means leveraging analytics platforms for meaningful insights as they relate to organic search. This data, and the ability to communicate it will support buy-in for SEO initiatives and align the more data-intensive stakeholders throughout the organization. The Web Development team is a major stakeholder whose efforts not only impact SEO, but all digital marketing teams and IT as well. From an SEO perspective, close collaboration is important to ensure that any planned front-end web development changes are in line with SEO best practices and do not revert any past optimization efforts. However, SEO teams should also be actively engaged with web development stakeholders when proposing new campaigns to ensure that recommendations can realistically be implemented and SEO requirements can be met. Deciding to partner with an Enterprise SEO agency can be a long process that requires significant due diligence, negotiations, and sign-offs before the hard work can truly start. When making this complex decision you need to be sure that your organization is confidently choosing an agency that will ultimately achieve your objectives and drive results. Your organization’s agency of choice must have the capabilities to understand and resolve your technical SEO challenges, and also to effectively align with your organization’s marketing efforts and way of doing business. To evaluate this, be acutely aware of how the agency interacts with your organization’s stakeholders during the discovery process. The right agency will be able to understand your organization’s technical needs but communicate them back in a way that satisfies everyone involved. There should be no confusion. Select an SEO agency with a proven track record of successfully working with well known enterprise brands. Research potential agencies for mentions, reviews, and testimonials from top brands. Ask potential partners for references when evaluating your decision as well. A strong measure of an Enterprise SEO agency’s caliber and ability to drive results will be reflected in case studies. When researching prospective agencies, explore their website for case studies that feature similar industries or organizational challenges. When approaching potential partners, also ask for samples of work or past results to confirm that the agency’s efforts will match your organization’s expectations. Due to the complex, dynamic, and, data-intensive nature of enterprise websites, an effective Enterprise SEO agency partner must have proven mastery of SEO fundamentals. The agency team must be experienced with resolving technical SEO issues on an a large scale related to thousand-to-million page websites, global visibility, and dynamic web languages. The agency must also have expertise with integrations between top enterprise marketing platforms to ensure that the websites works seamlessly with solutions tied to analytics, CRM, or marketing automation. Evaluate potential agency partners based on their track record, such as case studies, clientele, and proven results. Also look to the strength of the agency team to determine if the right skillsets for your organization are fully available to leverage. Many myths and misconceptions persist about Enterprise SEO throughout the marketing industry and across large organizations as a whole. This section will identify and dispel some of the more frequent ones that you may encounter. Close involvement with web development and content stakeholders is necessary to ensure a relevant and high quality web experience for users and search engines. Working with PR and brand management teams can be highly beneficial to improving your website’s authority by attracting high quality links. Alignment with IT is required to implement technical and on-page changes to strengthen how search engines discover and index the website. Reality: SEO is a long-term endeavour for an organization’s ever-expanding web presence. This is especially relevant for enterprises with ongoing marketing campaigns and large dynamic websites as pages can frequently change at a significant scale. SEO efforts must ensure that website changes are proactively monitored and mitigated for potential issues. Ongoing SEO campaigns are also required to remain competitive by continually growing authority. And regular research and analysis is required to stay up-to-date with both user and search engine behaviour. Reality: It’s true that SEO involves technical considerations on the website and close collaboration with IT is a must. However, considering SEO as a purely technical activity would significantly limit the true impact that it can have on an enterprise’s success. SEO is more accurately a function of marketing as it directly focuses on leveraging organic search to attract the right customers with the right keywords, and delivering relevant & engaging content on the website to generate sales. Reality: PPC campaigns can be a powerful source of revenue for nearly any organization, but they can also be very costly – especially on an enterprise scale. High ROI is critical for any effective PPC campaign. If it is the only channel being used to target search traffic, there is a risk that ad spend will be inefficiently allocated across all stages of the funnel rather than just focusing on the top converting terms. With SEO, you can optimize for the most impactful and relevant keywords to reach your target audience, but each individual click does not incur a direct cost as PPC would. Ideally, with both channels operating effectively, an organization’s collective search efforts will be lean, targeted, and optimized for high ROI. Reality: For large enterprises, brand awareness is a significant competitive advantage. It is also very likely that branded searches drive high volumes of organic search traffic as a result. However, while branded searches can be a strong and steady source of traffic, the caveat is that this is traffic that already knows the brand. These users may be returning customers or ready to convert, but they only represent a portion of potential search traffic. Non-branded traffic represents new opportunities. These are users that are searching for the services you offer but are not yet aware of your brand. If your organization does not actively optimize for these users they will likely be lost to competitors and your overall growth & revenue from organic search will be limited. Reality: In this case, correlation does not imply causation. According to Google, large websites do not automatically rank higher than smaller websites so there is no inherent advantage to having a high volume of pages. Rather, the key is to have the most optimized, authoritative, and valuable website. Large websites are essentially playing the odds that by sheer volume they’ll be seen as the best candidate for a top ranking. However, smaller competitors that are strongly invested in SEO with focused marketing campaigns to create the valuable and authoritative content can certainly surpass much larger competitors that are lagging behind. Search Engine Optimization can be a winner-takes-all game, especially for major brands. A victory pulls in 5.6 times the ROI that Paid Marketing does, despite costing only ⅛ the allotted budget. Winning in this fantastic market is a struggle for dominance in which many enterprises are massively under invested, sometimes just “topping up” periodically with audits and no all-encompassing SEO Strategy. In parting, we hope that this playbook has helped you understand the complexity of Enterprise SEO and the potential it has for helping you meet and exceed your marketing and business objectives. Need someone to help you execute this playbook? Talk to us about growing your business with SEO.